Urban Decay has been winning the makeup game lately with all the gorgeous launches they have put out this year (this cheek palette stunned me from first use). 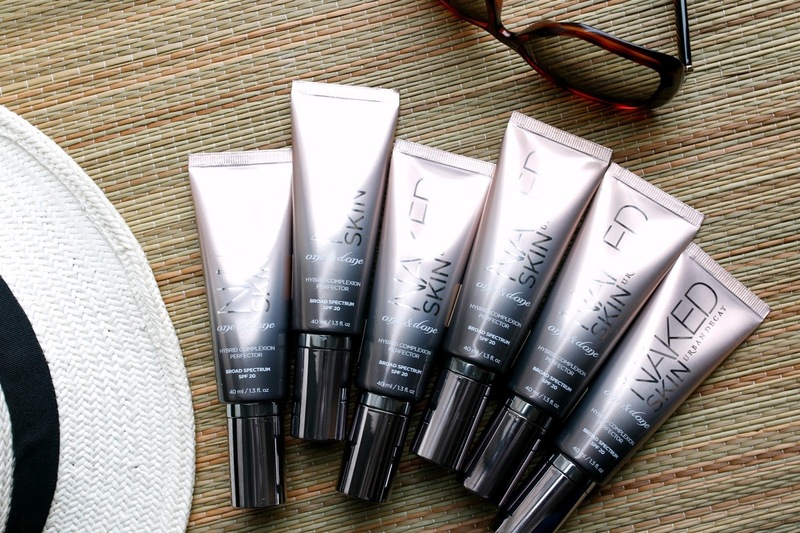 When I received their summer collection in the mail, I was immediately drawn to these Hybrid Complexion Perfectors. Maybe it's because I am a foundation lover addict (this instagram photo is proof - yikes! ), but either way I was curious what exactly a "complexion perfector" would do for my skin. Rather than go online to read the description like I usually do with a new product I am testing, I first went to the mirror and applied it. 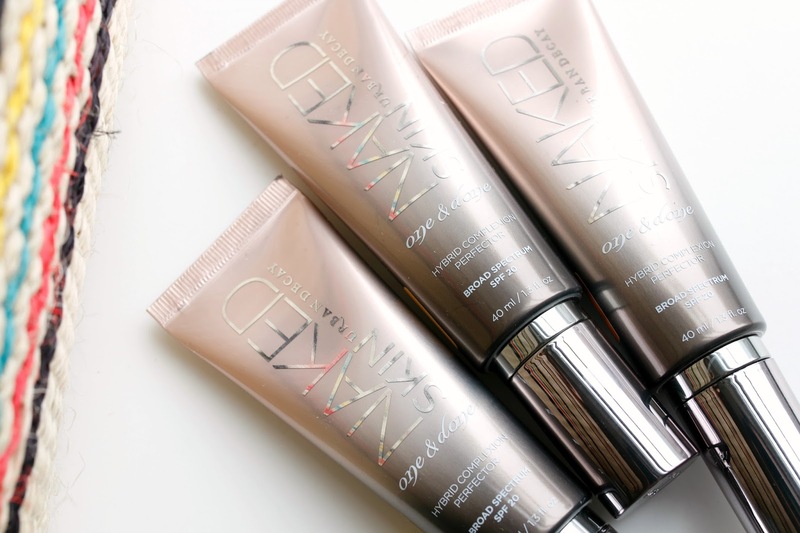 I was anticipating a very sheer tinted moisturizer-like product that would probably work as a base before my foundations or on the weekends when I want something to just throw on to even out my skin tone. As I applied it on the skin (I've been using this brush which gives a flawless finish and is only $6! ), the texture was quite sheer until I began buffing it in. Slowly all redness disappeared, pores looked smaller and my skin looked fresh and radiant like I just had the best facial of my life. After seeing how gorgeous it made my skin look, I went to read the product description on Sephora.com. My results were spot on with their promises of "blurring imperfections and evening out skintone for a natural result". However, most foundations/makeup bases look great when first applied so I left it on for the rest of the day and checked back in 6.5 hours later. I was shocked at how beautiful my skin still looked and all the "perfecting" it had done that morning was still in tact. It reminded me of all my skincare based foundations because it looked undetectable on the skin. Those with oily skin may want a touch of mattifying powder in the t-zone, but I didn't feel it was too shiny for me. I anticipate that in the summer I may need a powder, however for now I love the radiant finish. Now let's talk color range. I felt it had a good range, though I would have liked to see one shade lighter than Light and one shade deeper than Deep just to make sure everyone is included. The Light shade worked for me, though in the winter it may be a touch too dark. I suspect that in the summer, this will be my perfect color. 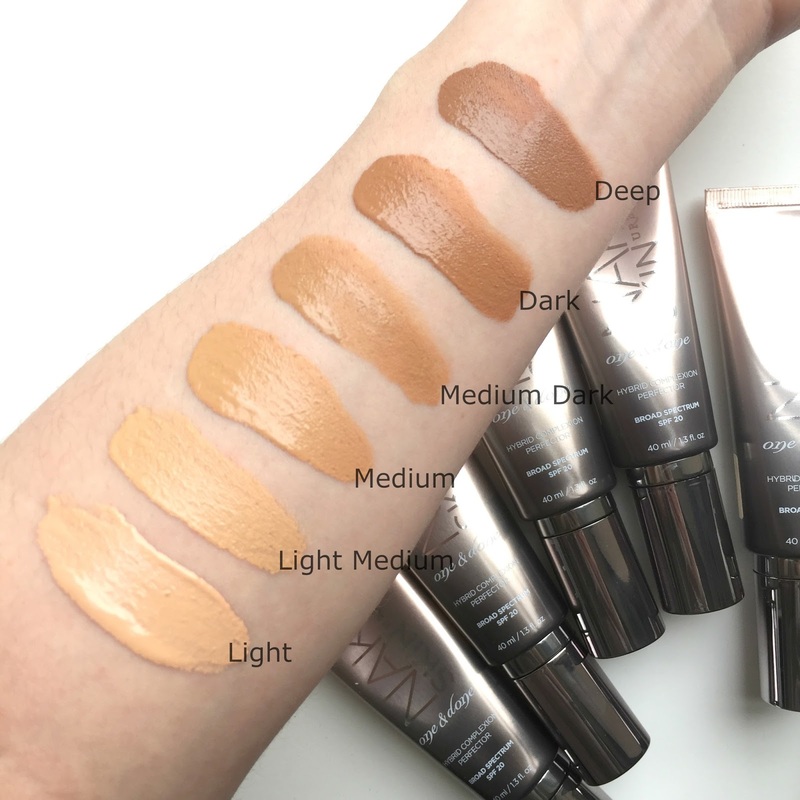 It should also be noted that the swatches are incredibly deceiving, because looking at my shade (Light) in the above picture, there is no way I would think it could match my skintone. However, there is a slight self-adjusting property to this complexion perfector (this is my observation not their claim) and it worked well for my pale coloring. For a product that was not on my radar and didn't have me waiting patiently to try, I was shocked at the performance. There are a ton of foundations on my wish list that I want to buy, but it's the one that I didn't see coming that may be the standout. I cant wait to pick one up and test it out!! I've seen a couple of raves about this new foundation this week, and it's now firmly on my radar. I love lighter bases so this sounds really up my street. Do you think that works and dry on oil skin? I have oily skin and it works on me. Though I still need a powder to set it and keep my t-zone matte.